Gylfi Sigurdsson and Alberto Paloschi struck as Swansea came from two goals down to damage Stoke's European hopes. Ibrahim Afellay marked his 30th birthday by giving Mark Hughes' side a half-time lead as he headed in Marko Arnautovic's cross. Bojan Krkic doubled the lead early in the second half with a fine solo goal. But Sigurdsson pulled one back with a shot on the turn that wrong-footed keeper Jakob Haugaard, and Paloschi's deflected strike earned a point. It has not been a good few days for Swansea head coach Francesco Guidolin, who has had to deal with widespread reports that Brendan Rodgers will return to the club to take his job at the end of the season. There was little sign that things were about to improve for Guidolin, as his side were second best for the first hour. However, two substitutions by Swansea's boss changed the game, with the lively Jefferson Montero causing all manner of problems down the left, and Paloschi snatching the equaliser. It was the Italian striker's second goal for the club since his £8m move from Chievo in January and, although it came with the aid of a deflection, it was no less sweet for that. There was a degree of sweet revenge on Hughes for Guidolin too. The Swansea coach's Vicenza side had been denied a place in the final of the European Cup Winners' Cup by a dramatic goal by Hughes for Chelsea in 1998. This time, the Italian had the final word, and Swansea - who have reached 37 points - are surely safe from relegation. With Stoke's first-choice goalkeeper Jack Butland ruled out for the rest of the season - as well as Euro 2016 - after breaking his ankle on England duty seven days earlier, this was a chance for Jakob Haugaard to impress. The Dane, signed from Midtjylland last summer, made his Premier League debut, but did not have the most auspicious of afternoons. He flapped at one early corner, sending the ball high into the air with a punch that made next to no distance, and looked less than comfortable under pressure. Haugaard should really have kept out Sigurdsson's goal, which gave Swansea hope. The keeper may have been unsighted as the Iceland international turned to score from the edge of the penalty area, but the shot was well within his reach - and the scorer confirmed afterwards that it had not been deflected. Hughes has assembled a terrific squad at the Britannia Stadium; one that is well on course for their highest league finish since 1975 despite a raft of injuries. They have, though, developed a frustrating habit of slipping up just when their momentum looks set to carry them into contention for a place in Europe. Stoke lost to Southampton in their previous home game, when a win would have taken them to within a point of sixth place and, having won at Watford before the international break, they passed up another great chance to progress here. Afellay's opening goal was the least Stoke deserved for their first-half superiority and, when Bojan added a well-taken second by ending a mazy run with a precise low shot, the match should have been won. Swansea head coach Francesco Guidolin: "I am very happy because it's not easy coming into the Premier League. I saw, for example, what happened to Remi Garde at Aston Villa. We are seeing it with Rafa Benitez at Newcastle. It is not easy for anyone in our job to come in during the season. "I hope to see my team play well in the last weeks of the season. I saw my team play with solidarity and enthusiasm and collaboration and focus. This is an important message for us. I am very proud today." Stoke manager Mark Hughes: "I thought we were good value at 2-0. We created the vast majority of the chances up to that point and could have had more goals. "But 2-0 isn't the easiest of leads to protect. Maybe we got defensive when they got the goal. They got the second goal from their second shot on target. One of Swansea's players was in an offside position for it, and we've been in to see the officials. But we don't get too many of those decisions." Ibrahim Afellay scored a Premier League goal at the Britannia Stadium for the first time on his 30th birthday. It was also Stoke's 200th Premier League home goal. Gylfi Sigurdsson (10) is the first Icelandic player to score 10 or more goals in a Premier League season since Eidur Gudjohnsen in 2004-05 (12). Marko Arnautovic, who assisted Afellay's opener, has been involved in more league goals this season than any other Stoke player (15 in total - 10 goals, 5 assists). Swansea have kept just one clean sheet in their past 17 Premier League away games. Stoke will attempt to revive their Europa League challenge when they visit Liverpool a week on Sunday (16:00 BST), the day after Swansea bid to reach the 40-point mark by beating Chelsea at the Liberty Stadium (15:00 BST). Match ends, Stoke City 2, Swansea City 2. Second Half ends, Stoke City 2, Swansea City 2. Foul by Alberto Paloschi (Swansea City). Offside, Stoke City. Jakob Haugaard tries a through ball, but Joselu is caught offside. Attempt saved. Joselu (Stoke City) right footed shot from outside the box is saved in the centre of the goal. Attempt missed. Jefferson Montero (Swansea City) right footed shot from the left side of the box misses to the left. Assisted by Gylfi Sigurdsson. Attempt missed. Ibrahim Afellay (Stoke City) left footed shot from outside the box is just a bit too high. Corner, Swansea City. Conceded by Stephen Ireland. Corner, Stoke City. Conceded by Jefferson Montero. Attempt missed. Joselu (Stoke City) left footed shot from the centre of the box is too high. Assisted by Marko Arnautovic with a cross. Attempt missed. Marko Arnautovic (Stoke City) right footed shot from outside the box is close, but misses to the right from a direct free kick. Ibrahim Afellay (Stoke City) wins a free kick in the attacking half. Substitution, Swansea City. Neil Taylor replaces Kyle Naughton because of an injury. Substitution, Stoke City. Stephen Ireland replaces Glenn Whelan. Goal! Stoke City 2, Swansea City 2. 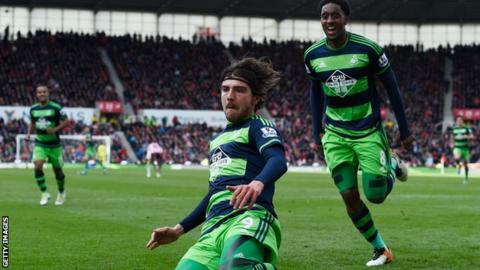 Alberto Paloschi (Swansea City) right footed shot from outside the box to the bottom left corner. Assisted by Ashley Williams. Attempt blocked. Alberto Paloschi (Swansea City) left footed shot from the left side of the box is blocked. Assisted by Ashley Williams. Substitution, Swansea City. Alberto Paloschi replaces Bafétimbi Gomis. Goal! Stoke City 2, Swansea City 1. Gylfi Sigurdsson (Swansea City) right footed shot from outside the box to the bottom left corner. Assisted by Wayne Routledge with a cross. Foul by Jack Cork (Swansea City). Attempt blocked. Angel Rangel (Swansea City) left footed shot from the right side of the box is blocked. Assisted by Bafétimbi Gomis. Corner, Swansea City. Conceded by Philipp Wollscheid. Attempt blocked. Gylfi Sigurdsson (Swansea City) right footed shot from outside the box is blocked. Assisted by Wayne Routledge.